Eyeteeth: Incisive ideas: No doubt. The last time Bush had "no doubt" about something it was "that the Iraq regime continues to possess and conceal some of the most lethal weapons ever devised." So when he says "there's no doubt in my mind it is legal" to wiretap citizens without a warrant, we're suppose to believe him? Nixon, May 1977: "When the President does it, that means that it it is not illegal. Yes and yes again, whyz.ache.err, I'll own up to it. 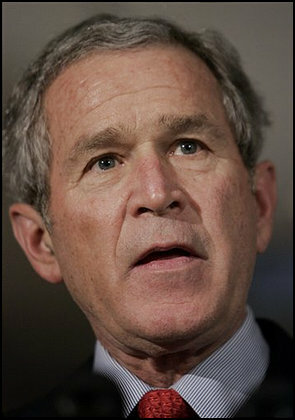 There is a ton of personal animus in my campaign to get the "smirking chimp", also known as "dum'ya botch", impeached. It's not at all like I don't have cause. For one thing, what he's peddling as, get this, "terrorist surveillance" ain't Shinola. I'm hoping you'll grant me the small favor of patience. I would like you, at first, to read straight through to the end of this text, without clicking on any of the enclosed hyperlinks. In case, you'd like to know, the hyperlink to your blog, specifically, "eyeteeth", is found at the third hyperlink on the list below ... ah, please remember, no clicking until AFTER reading the entire text. Perusing your blog, I believe I arrived at what is a reasonable inference. That is, both you and your readers concur with my interpretation of "terrorist surveillance". Wood'ja (?) buh-leave! A civilian like me, and up to his ears in credit card debt, could come up with a game plan to snag Osama bin Ladin. As for my plan for capturing Osama, again I should like to ask to refrain from clicking on any enclosed hyperlink, until AFTER you've read the entirety of the text. The hyperlink just above this sentence leads to my game plan. If you've gotten this far on the first read, without clicking on any of the enclosed hyperlinks, congrats! Whatever the case, remind or prepare, please keep in mind that it's a good bet that everything else to snag bin Ladin has already been tried. I think it's time we tried drawing on one of the few activities Americans do better than any other national group, music and pizza delivery being among those few activities. oh, yes, surely, you've heard about the government "requesting" certain records about internet activity. oh, br'dah! ... cynical and skeptical lil'ole me, I'm smelling a rat in all that. Quite candidly, I have cause to suspect that more than compiling statistics on access to pornographic websites is involved. oh, yeah, right after Hitler came to power, the German people were assured that, if they were innocent of untoward activity, they would have nothing to worry about ... yeah, right. Incidentally, the second hyperlink leads to a piece that relates to governmental eavesdropping WITHOUT a warrant.